"The chemicals in tobacco smoke reach your lungs quickly every time you inhale, causing damage immediately," Dr Benjamin says. "Inhaling even the smallest amount of tobacco smoke can also damage your DNA, which can lead to cancer." What's so wrong with this statement? While there's no question that smoking factory-made cigarettes is harmful to your health, this statement is being made by a US Surgeon General who utterly fails to offer similar warnings for all the other toxic products made by powerful corporations -- products that can kill you far more easily. For example, if smoking one cigarette can kill you, so can taking one pharmaceutical pill. Numerous pharmaceuticals cause DNA mutations , meaning that they, too, can "damage your DNA, which can lead to cancer," to use the Surgeon General's own words. At the same time, there are countless personal care products such as perfumes, shampoos, skin lotions, antibacterial soaps, sunscreens and cosmetics that are also loaded with DNA-mutating synthetic chemicals. The average perfume or cologne product contains over 20 carcinogenic chemicals, all of which contribute to an increased risk of cancer. So where is the Surgeon General's warning about the risk of death from using all these products? On these issues, the office of the Surgeon General is strangely silent. Perhaps that's because much of what the Surgeon General actually says is really just (tobacco) smoke and mirrors. See, in the circle of conventional medicine (to which the Surgeon General belongs), there are some products that are considered politically correct to publicly bash -- such as cigarettes -- while there are other products which are collectively far more dangerous to public health (like chemotherapy) which are entirely off limits. You won't see the Surgeon General warning anyone that "just one chemotherapy treatment can cause cancer" even though it is scientifically true that chemotherapy subjects your body to far worse cancer-causing agents than the ones found in cigarette smoke! What's really fascinating in all this is that conventional doctors will bash cigarettes and explain that "smoking causes cancer," but when smokers show up at their clinics with cancer and want some treatment, those very same doctors will poison them with yet more cancer-causing chemicals in the form of chemotherapy! See, it's "fashionable" to attack cigarettes now. It's a safe target. No one gets fired from the government for saying that cigarettes are bad for you. But no one dares point out that chemotherapy is far more deadly than cigarette smoke because the cancer industry, unlike the tobacco industry, still holds influence in the medical industry. At one time, Big Tobacco dominated the health doctrine of conventional medicine. A few decades ago, the Journal of the American Medical Association (JAMA) used to run advertisements for cigarettes. They even used headlines like, "More doctors smoke Camels than any other cigarette." The ad says, "Doctors in every branch of medicine were asked: What cigarette do you smoke? The brand named most was Camel!" For decades, then, JAMA was promoting cigarettes -- a product which the Surgeon General now says can kill you even if you only use them once. It was only after decades of promoting Big Tobacco that JAMA finally decided to stop running cigarette ads. By that time, the evidence showing the harm of cigarette smoke was irrefutable. 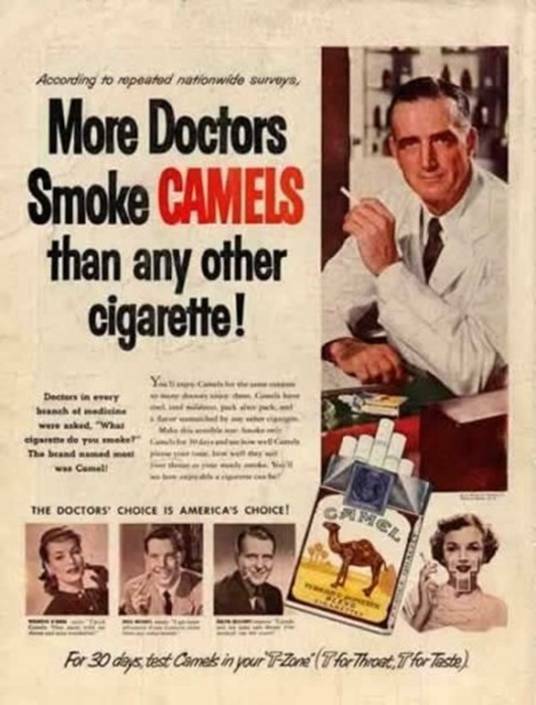 Even the doctors had to finally admit that their advice was wrong and that cigarettes were bad for your health (but they stalled for decades). Now the medical industry is pushing a similarly toxic product: Chemotherapy, which is far more hazardous to your health than cigarettes. Just one session of chemotherapy can cause permanent brain damage and kidney damage (https://www.naturalnews.com/020665.html). Modern medicine also pushes radiation therapy which, by its very nature, is a cancer-causing treatment. On top of that, conventional doctors promote water fluoridation, dangerous prescription pharmaceuticals and over-the-counter medications containing synthetic chemicals that aggressively promote cancer. You see, this is why conventional medicine can't be called "scientific" by any skeptical person. If it were truly scientific, then ALL the products and treatments that pose a serious risk of cancer would be publicly named by the Surgeon General. After all, doesn't the public deserve the right to know that chemotherapy causes yet more cancer? But that's not what we see in America today. Instead, we see that certain "selected targets" are allowed to be described as promoting cancer while other things that are far worse for your health are utterly ignored. This whole practice of warning Americans about cancer, in other words, has become highly politicized. Are cigarettes bad for your health? Absolutely. Nothing in this article should be misconstrued as advocating cigarette smoking. Yet if we are to make sense of the world and accurately assess health risks, we must be given truthful information about other cancer risks that threaten the population, too. And yet that information is kept in a secret black box somewhere under the Surgeon General's desk, apparently. You won't hear the Surgeon General warn Americans about the cancer risk from using mobile phones, for example. Nor will you hear any warning about drinking fluoride chemicals in the water supply, which have now been linked to reduce Iqs in children, by the way. Don't expect the Surgeon General to warn you about the cancer-causing additives in the food supply, such as sodium nitrite, aspartame, MSG or artificial food colors. No factual talk is allowed on those topics. The American people are intentionally kept in the dark on all that, even though processed meat products are killing little children all across the country through leukemia and brain cancer (https://www.naturalnews.com/007133.html). And certainly don't expect the Surgeon General to warn women that mammograms cause breast cancer and that mammography is the best recruitment machine for scaring women into cancer centers to treat tiny tumors that are, nine times out of ten, no threat to their health in the first place (https://www.naturalnews.com/020829.html). Finally, where is the Surgeon General on the vitamin D issue? If this Surgeon General had even one iota of compassion for the health of the American people, she would be touting the disease prevention benefits of vitamin D. There is no nutrient that holds more promise for ending the epidemic of cancer and preventing chronic degenerative disease than vitamin D. It's cheap, it's safe and it's widely available right now without a prescription. So why the silence on vitamin D? You already know the answer, probably: Because medical authorities intentionally remain silent on vitamin D in order to prop up the profits of the pharmaceutical companies and cancer clinics (https://www.naturalnews.com/030598_vitamin_D_...) that only exist due to widespread vitamin D deficiency. So instead of telling you the truth about all this, US Surgeon General Dr Regina M. Benjamin announces that cigarettes are dangerous. Gee, really? Tell us something we didn't already know in the 1950's, Regina. The year is 2010. Our people are dying. Our nation is going bankrupt from sick-care costs. We're drowning in pharmaceuticals. Why not say something honest, for a change, about the natural cures available to people right now? Or how about this: Dare to tell the truth about what the American people really need to hear: That chemotherapy is deadly, mammograms harm more women than they help, and vitamin D is the answer to our nation's health care challenges. "During times of universal deceit, telling the truth becomes a revolutionary act" said George Orwell. Any Surgeon General who dared tell the truth about cancer would probably be "suicided" within 24 hours just like Bernie Madoff's son. If there's one thing the U.S. power brokers have no stomach for, it's the truth about cancer. Cancer is a multi-billion dollar industry. Its very survival depends on keeping people sick with cancer and isolating people from information that could help them prevent cancer or even cure cancer. The US Surgeon General, whether she intends to play this role or not, is playing an active role in the conspiracy of silence on the true causes -- and cures -- of cancer. Remember, this, too: When a national sick-care system is failing, those who run the system must desperately work to distract people from WHY it is failing. So instead of discussing the failed cancer industry, the fraud of mammography, the seasonal flu vaccination schemes and all the other elements of conventional medicine that have failed our nation, the Surgeon General wants you to focus on -- what else? -- cigarettes. It's an old magician's sleight-of-hand trick, of course. They'll have you keep your eye on one hand (the cigarettes) while they're duping you with the other hand (socialized medical monopoly racket). Don't think about cancer, or mammograms, or chemotherapy, or pharmaceuticals or any of that other stuff that's killing you. Keep your eyes focused on the cigarette smoke, folks, because that's what the Surgeon General wants you to think is really bad for you.